The centuries-old art form of pingshu, or storytelling, is making a welcome return to television after a long hiatus. Xu Fan reports. One desk and one folded fan was all that consisted for the props used by pingshu (storytelling) master Tian Lianyuan to bring to life a battlefield story from Yang Jia Jiang (Generals of the Yang Family), an influential novel based on the titular legendary family in the Northern Song Dynasty (960-1127) era. Although Tian is 76 years old, he delivered his dialogue with power and performed with emotion. When the plot rose to its climax - where a warrior on horseback wields his sword as he rides toward his enemy - he abruptly kicked his leg high to mimic the role's martial arts skills. The stunt drew ovations from the audience, who watched the performance at the headquarters of one of the country's biggest broadcasters, Beijing TV, on Nov 22. Alongside well-known pingshu artists Lian Liru and Liu Lanfang, Tian was shooting Beijing Pingshu Dahui (Assembly of Pingshu Artists in Beijing), a program showcasing the artists' storytelling performances. 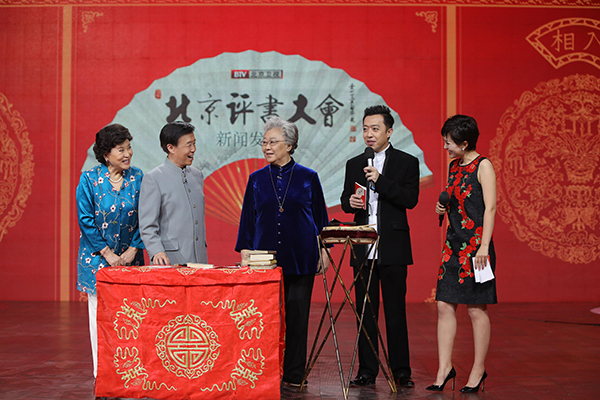 The 25-minute program started to air on Nov 28 on Beijing Satellite TV, and is scheduled to be broadcast every morning from Tuesday to Friday. Pingshu is a traditional art form that usually sees a performer wrapped in a Chinese-style gown recount a legend through dialogue and exaggerated gestures. Most of the stories are adapted from classic novels penned by ancient authors.